Hiring? Toptal handpicks top Python engineers to suit your needs. Donald Knuth said that “premature optimization is the root of all evil.” But there comes a time, usually in mature projects with high loads, when there is an inevitable need to optimize. In this article, I would like to talk about five common methods to optimize your web project’s code. I will use Django, but the principles should be similar for other frameworks and languages. In this article, I will use these methods to reduce the response time of a query from 77 to 3.7 seconds. The example code is adapted from a real project that I have worked with and is demonstrative of performance optimization techniques. In case you would like to follow along and see the results yourself, you can grab the code at its initial state on GitHub and make the corresponding changes while following along the article. I’ll be using Python 2, since some third-party packages are not yet available for Python 3. """Provide a hash property for models.""" """Represent a country in which the house is positioned.""" """Represent a house with its characteristics.""" The abstract HashableModel provides any model that inherits from it a hash property that contains the instance’s primary key and the content type of the model. This hides sensitive data, like instance IDs, by substituting them with a hash. It may also be useful in cases when your project has multiple models and you need a centralized place that unhashes and decides what to do with different model instances of different classes. Note that for our small project, hashing is not really needed, as we can deal without it, but it will help demonstrate some optimization techniques, so I will keep it there. Now, we populate our database with some data (a total of 100,000 house instances generated using factory-boy: 50,000 for one country, 40,000 for another, and 10,000 for a third country) and are ready to test the performance of our app. But not all of them are relevant in measuring how good our project performs. Generally speaking, there are two main metrics that are the most important: how long something executes and how much memory it needs. In a web project, response time (the time required for the server to receive a request generated by some user’s action, process it and send back the result) is usually the most important metric, as it doesn’t let users get bored while waiting for a response and switch to another tab in their browser. The overall response time is 77 seconds, out of which 16 seconds are spent on queries in the database, where there have been a total of 50,000 queries made. With such huge numbers, there is plenty room for improvement, so let’s start. 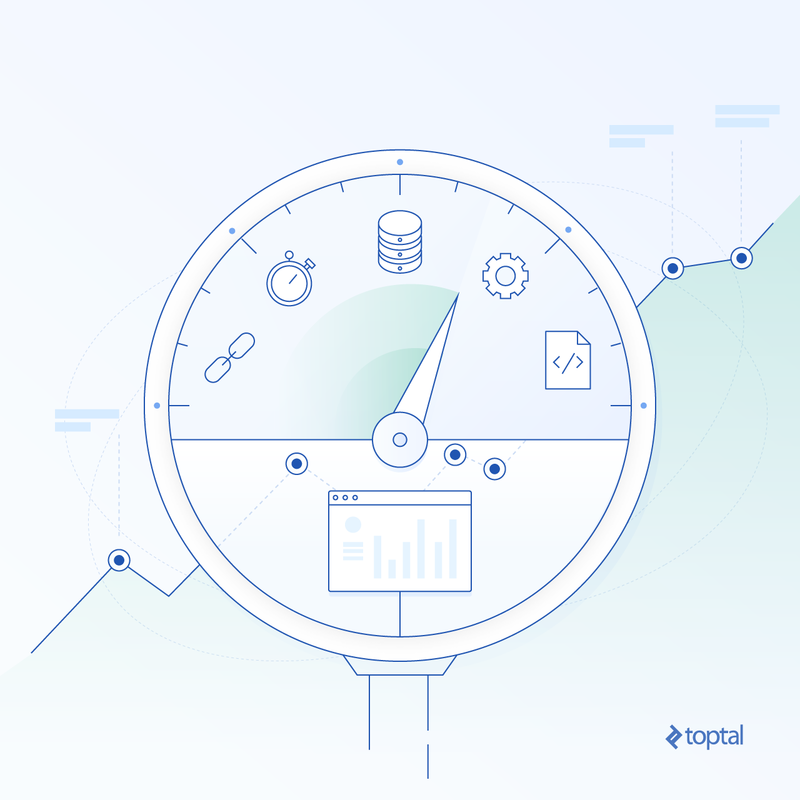 One of the most frequent tips on performance optimization is to make sure your database queries are optimized. This case is no exception. Moreover, we can do several things about our queries to optimize the response time. The source of this problem is the fact that, in Django, query sets are lazy. This means that a query set is not evaluated and it does not hit the database until you actually need to get the data. At the same time, it gets only the data you told it to, making subsequent requests if any additional data is needed. That’s exactly what happened in our case. When getting the query set through House.objects.filter(country=country), Django gets a list of all houses in the given country. However, when serializing a house instance, HouseSerializer requires the country instance of the house for computing the serializer’s country field. As the country data isn’t present in the query set, django makes an additional request to get that data. And it does so for every house in the query set—that’s 50,000 times in all. The overall response time dropped to 36 seconds and the time spent in the database is ~100ms with only 4 queries! That’s great news, but we can do more. By default, Django extracts all fields from the database. However, when you have huge tables with many columns and rows, it makes sense to tell Django what specific fields to extract, so that it won’t spend time to get information that won’t be used at all. In our case, we need only five fields for serialization, but we have 17 fields. It makes sense to specify exactly what fields to extract from the database, so that we further cut down the response time. Django has the defer() and the only() query set methods for doing exactly this. The first one specifies what fields not to load and the second one specifies what fields to load only. 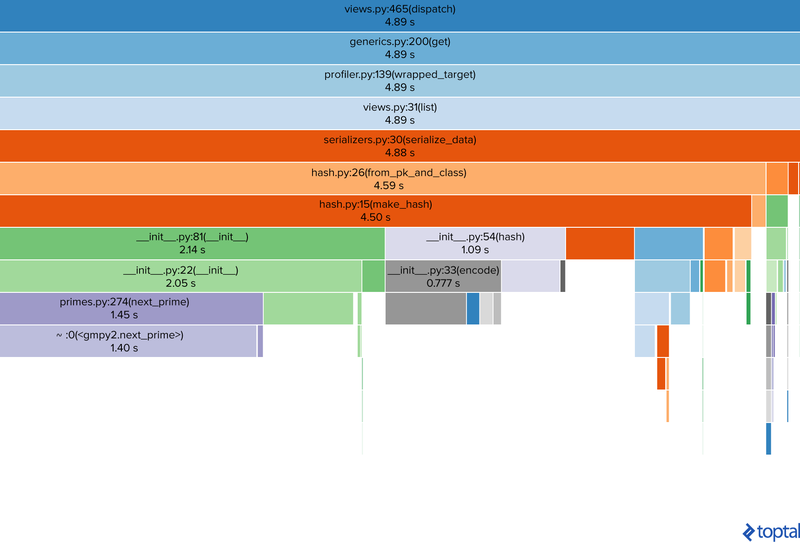 This cut the time spent on queries in half, which is good, but 50ms is not that much. The overall time also slightly dropped, but there is more space to cut it. You can’t infinitely optimize the database queries, and our last result just showed that. Even if we hypothetically decrease the time spent on queries to 0, we would still face the reality of waiting for half a minute to get the response. It’s time to switch to another level of optimization: business logic. Sometimes, third-party packages come with a lot of overhead for simple tasks. One such example is our task to return serialized house instances. Django REST Framework is great, with lots of useful features out of the box. However, our main goal right now is to cut down the response time, so it is a great candidate for optimization, especially that the serialized objects are quite simple. Return a list of hashed objects from the given queryset. This looks better now. The response time was almost halved due to the fact that we didn’t employ DRF serializers code. Another measurable result—the number of total function calls made during the request/response cycle—dropped from 15,859,427 calls (from the request made in section 1.2 above) to 9,257,469 calls. This means that around 1/3 of all function calls were made by Django REST Framework. The optimization techniques described above are the most common, the ones you can do without thorough analysis and thought. However, 17 seconds still feels pretty long; in order to reduce this number, we will need to dive deeper into our code and analyze what happens under the hood. In other words, we will need to profile our code. You can do the profiling yourself, using the built-in Python profiler, or you can use some third party packages for it (that are using the built-in Python profiler). As we already use silk, it can profile the code and generate a binary profile file, that we can further visualize. There are several visualization packages that transform a binary profile into some insightful visualizations. I will be using the snakeviz package. From top to bottom is the call stack, displaying the file name, method/function name with its line number and the corresponding cumulative time spent in that method. Now it is easier to see that a lion’s share of time is dedicated to computing the hash (the __init__.py and primes.py rectangles of violet color). Currently, this is the main performance bottleneck in our code, but at the same time it is not really our code—it’s a third-party package. Check for a new version of the package (that hopefully has a better performance). Find another package that performs better on tasks we need. Write our own implementation that will beat the performance of the package we currently use. Luckily for me, there is a newer version of the basehash package that is responsible for hashing. The code uses v.2.1.0, but there is a v.3.0.4. Such situations, when you are able to update to a newer version of a package, are more probable when you are working on an existing project. We cut down the response time from 17 to under 8 seconds. Great result, but there is one more thing we should look at. So far, we have improved our queries, substituted third-party complex and generic code with our own very specific functions, and updated third-party packages, but we left our existing code untouched. But sometimes a small refactoring of existing code can bring impressive results. But for this we need again to analyze the profiling results. Taking a closer look, you can see that hashing is still a problem (not surprisingly, it is the only thing we do with our data), although we did improve in that direction. However, the greenish rectangle that says that __init__.py consumes 2.14 seconds bothers me, along with the grayish __init__.py:54(hash) that goes right after it. This means that some initialization takes a long time. Let’s take a look at the source code of the basehash package. # Initialization of `base36` class initializes the parent, `base` class. 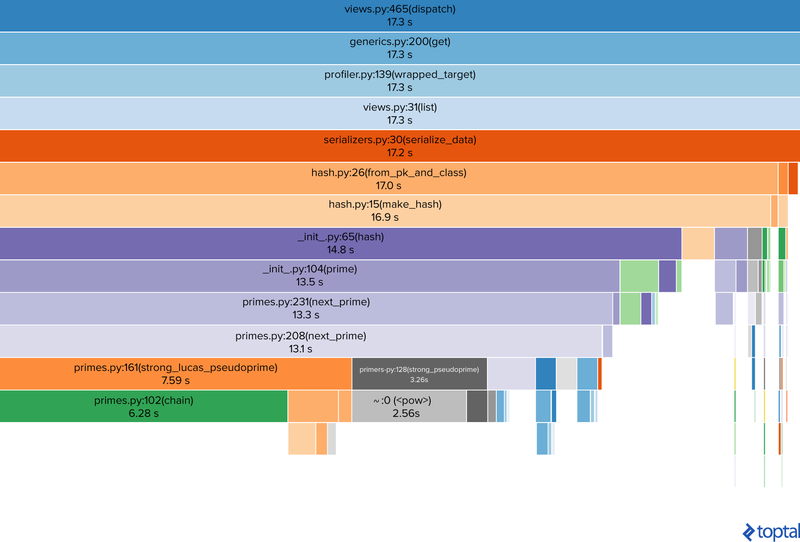 As you can see, the initialization of a base instance requires a call of the next_prime function; that is quite heavy as we can see in the bottom left rectangles of the visualization above. As you can see, I have labeled two methods that are initializing a base36 instance on each method call, which is not really required. The final result is under four seconds, which is much smaller than what we started with. Further optimization of response time can be achieved using caching, but I won’t tackle it in this article. Performance optimization is a process of analysis and discovery. There are no hard rules that apply to all cases, as each project has its own flow and bottlenecks. However, the first thing you should do is profile your code. And if in such a short example I could reduce the response time from 77 seconds to 3.7 seconds, huge projects have even more optimization potential. If you’re interested in reading more Django related articles, check out Top 10 Mistakes that Django Developers Make by fellow Toptal Django Developer Alexandr Shurigin. Very informative article ! Thanks lulian. Do you also run a blog or some place where i can follow for more such insights ? Nice article! I have some feedback, though. Instead of constantly computing hash at runtime, we could create a column which would contain the computed hash. Besides, replacing battle-tested DRF serializers with a handcrafted one might improve performance but could potentially introduce bugs and security issues. Finally, how about putting a caching middleware behind all this logic? It makes more sense to compute the results once and then server static data each time. Thanks Dima! I agree with your comment and that caching is an option as well and generally speaking, caching is a topic in itself. The goal of my article was to show the detailed path of this process, to demonstrate, based on a simple example, the steps and process of approaching performance optimization, as in big projects you will have to step through all of them at some point. Iulian has over seven years of experience developing web projects of all sizes, from simple web sites to complex SaaS products. He has worked individually and in teams; in big companies and in startups. This diversity of experience has broadened his technical skillset, and his time as a corporate trainer has helped to develop strong communication and people skills. Iulian is also passionate about using Data Science to improve his projects.